Have you been wanting to try Cathy Valencia signature and latest products and services? Experience the Cathy Valencia difference today and see for yourself what their treatments can do for you. Join the #RookieMommyPHTurns1 Blog Anniversary Giveaway and win one (1) Cathy Valencia Gift Pack (1 Tripple Whitening Papaya Soap, Cedrix Sigature Vanilla Cologne, The Eternal Youth Cream Samples, Cedrix Slimming Cream Samples) and P5,000 worth of Gift Certificate! Cathy Valencia Advanced Skin Clinic consistently ranks as one of the Philippines’ most trusted and leading skin and aesthetic clinics. Since 2002, we have been serving satisfied clients across the country with breakthroughs from both Oriental and Western technology. Giveaway is open to Metro Manila residents only. TAKE a selfie and post it on Instagram with your own caption with the hashtags: #RookieMommyPHTurns1 #CathyValenciaGiveaway, TAG us @rookiemommyph - DO NOT FORGET TO SET YOUR POST ON PUBLIC. #RookieMommyPHTurns1 Anniversary Giveaway starts on November 25, 2015 and will end on December 5, 2015, 12:00 pm. Announcement of winners will be posted on the blog and Rookie Mommy PH Facebook page on December 7, 2015. Winners will be contacted through email and items will be shipped via XEND delivery. *Shipping fee will be shouldered by the winner. P60.00 for Metro Manila via XEND delivery. 18 comments on "#RookieMommyPHTurns1 Blog Anniversary Giveaway: Cathy Valencia"
Thanks for joining! :) Good luck! Hope to win, I will share it to my mommy... thanks for this contest. 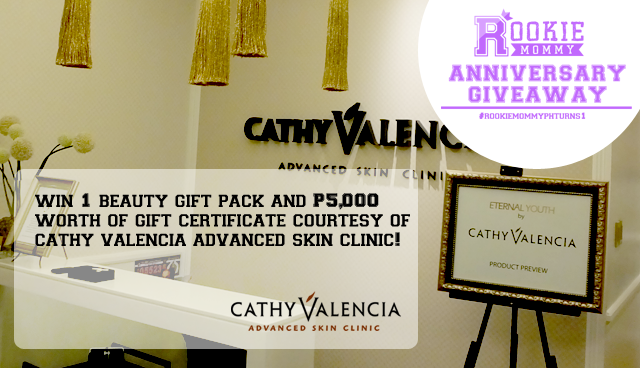 Let me experience advanced and premium skin care by Cathy Velencia! Social Media Manager Work-at-home momma, oa and panikera momma ,skincare junkie, loves ramyun and Kdramas, strong believer of Law of Attraction. The Numa Baby Clearance Sale!